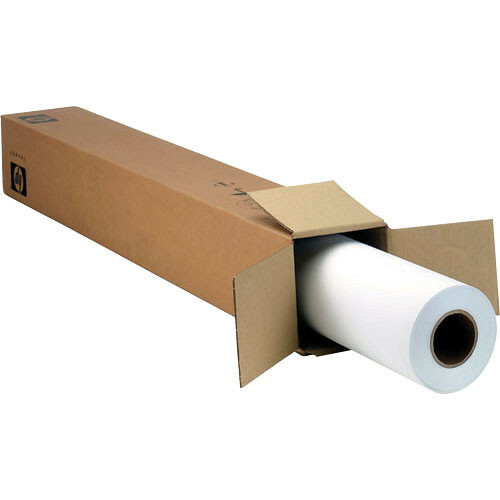 This 24"" x 100' roll of Premium Matte Photo Paper from HP is a large format paper optimized for printing photographs. It features a matte surface finish and a wood fiber and polyethylene base material along with a basis weight of 210 gsm and a thickness of 10.4 mil. Other qualities of this paper are an opacity of 98%, a brightness of 91%, and a whiteness of 130%. The paper is designed to last and features a maximum indoor display permanence of 200+ years. Also, it is water resistant and instant drying for immediate handling and lamination. This paper comes on a 2" core. Box Dimensions (LxWxH) 26.0 x 5.0 x 5.0"
Premium Matte Photo Paper (24"" x 100' Roll) is rated 5.0 out of 5 by 4. Rated 5 out of 5 by Rob from Great proofing paper - I use this for proofing color correct pages for our magazine. Works perfectly for this purpose. Rated 5 out of 5 by Ccec from I would purchase again The paper worked great in our printer. It was received as described and images look great. Rated 5 out of 5 by Missy from Great I love this paper. I make custom labels and they turn out perfect.